This article is guest blogged by Steven Millward, a Masters sprinter from Toronto. Which is best preserved 100m or 5000m Speed? As we age we lose muscular strength and anaerobic power – a sad but unavoidable fact for Masters sprinters. But our distance running colleagues also lose speed due to deterioration of aerobic energy systems. So which is best preserved as athletes age, sprinting speed (a measure of muscular strength and anaerobic energy output) or distance running speed (mostly dependent on aerobic energy)? 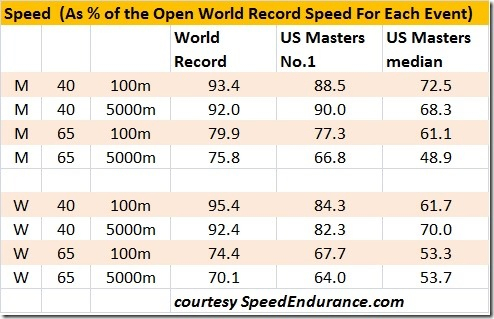 The Table below shows running speed (expressed as a % of the Open World Record speed for each event) for the 100m and 5000m, for men and women in the M/W 40 and M/W 65 age groups. 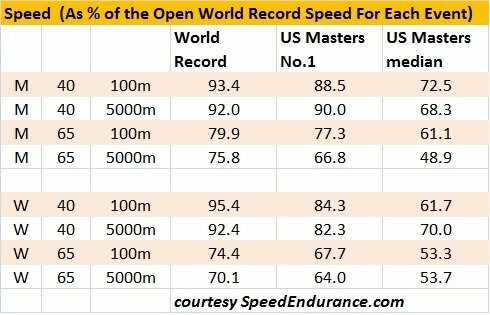 In the first column is the running speed % relative to the open world record for the Masters age group world record (obviously a very elite athlete!). In the 2nd column is the same for the number 1 time listed on the US Masters Track and Field Ranking website for 2012 (again an elite athlete). And in the 3rd column is the same for the median on the same list (the man or woman halfway down, presumably a recreational athlete like me!). Obviously this data would benefit from a larger sample size and statistical analysis! But just looking at the numbers, some trends jump out. For the men, at ages 40 and 65 the athletes are able to run at a slightly higher % of the open world record speed for the 100m than for the 5000m; apart from the 2012 lead times for the M 40 age group where the 5000m time is relatively faster. The relatively faster speed for the 100m is most marked for the M 65 age group for both the 2012 US Masters lead time and the recreational athlete. For the elite women the trend is the same, but is reversed for the W 40 recreational athlete where the 100m speed is relatively slower than the 5000m speed. For W 65 the recreational athletes 100m speed is almost the same as that of the 5000m, relative to the respective open world record speeds. What does all this tell us? Both elite and recreational male sprinters of 65 are relatively better than their distance running colleagues, presumably because by training to sprint they are able to maintain muscular strength and anaerobic power better than a distance runner can maintain his aerobic energy systems. The same trend is seen with the elite woman sprinters. Steven Millward is a Physician, researcher and recreational masters sprinter. 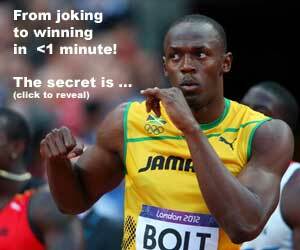 READ Usain Bolt 2012 Olympics: 9.66 in the Cards? 100 meters age 40. 9.97 = 96% Current oldest under 10- Kim collins age 37. Wait two years. Lagat age 40 13:09. He ran sub 13 at age 38 and I believe turns 39 today or tomorrow. That will be closer to 96%.